Glass is fragile. You drop it and it breaks, you drill it and it breaks, you hammer a metal setting around it and it breaks, you force it in to a bezel and it breaks… No wonder that some of us would rather not work with glass! There are however some techniques that are used extensively. Here is a discussion of these techniques. I am sure the list is not exhaustive. These are really common. They are easy. You don’t need to work the glass itself. Note that wire techniques are not specially good for rings or for jewelry that is likely to get banged around. Some of these techniques are a bit flimsy and the piece of glass can come out of the setting. There are numerous different wire wrapping techniques. I refer you to just one website. There are also YouTube videos. Just google “wirewrap beach glass”. 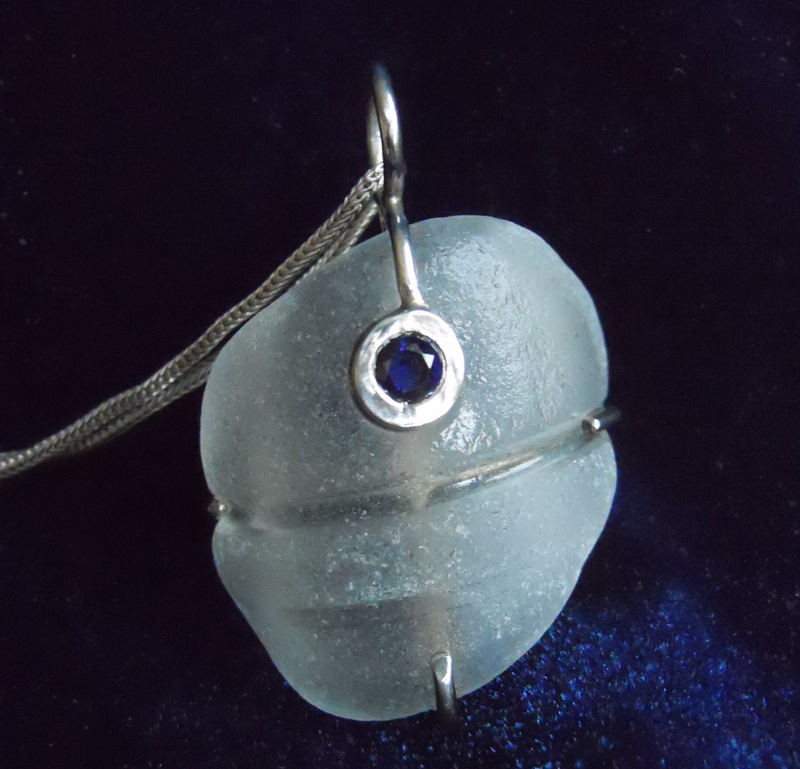 The “Blue Glass Pendant” shown here, was wrapped by myself with a homemade technique using fine silver wire, which is nice and soft. The earrings were wrapped by an unknown artist in Cusco, Peru. You can use thick wire that is not easily formed or wrapped. I like to use gauge 18 Sterling silver. The idea is to create a “basket” with prongs, place the glass in the basket, and bend the prongs around the glass to hold it in place. I have attached an example. Here the prongs are the same in the front and the back so that is does not matter if the pendant flips over, as the front and the back look identical. A variation of this technique allows for a smaller stone (blue sapphire in this case) to be set on one of the prongs! 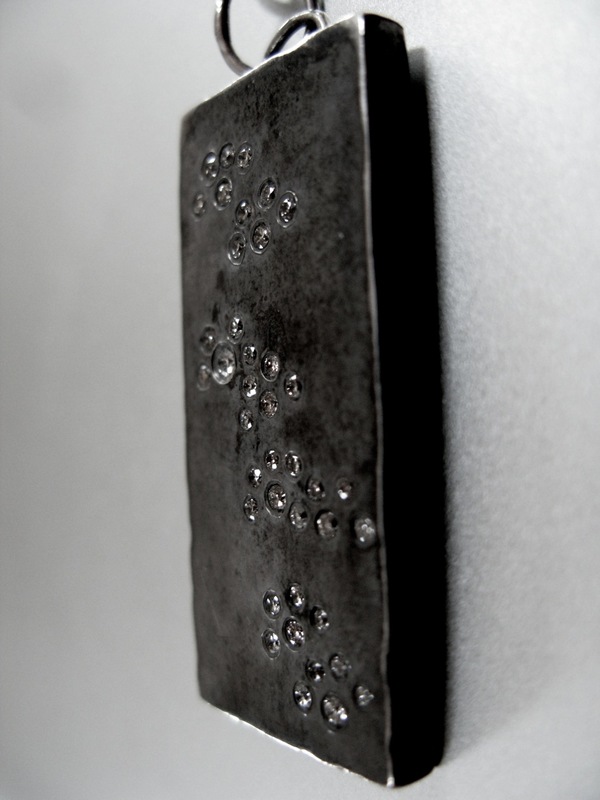 Bezel formed by hand with thin (gauge 32) soft silver. This is more serious. You will have to cut your silver, solder it together and form a bezel that is shaped after the irregular piece of glass that you want to frame. It has become my favorite method because the bezel protects the piece of sea glass. If you shape the base of the bezel, you can accommodate a rounded piece of glass, such as a piece from the neck of a bottle. Here are a few examples. 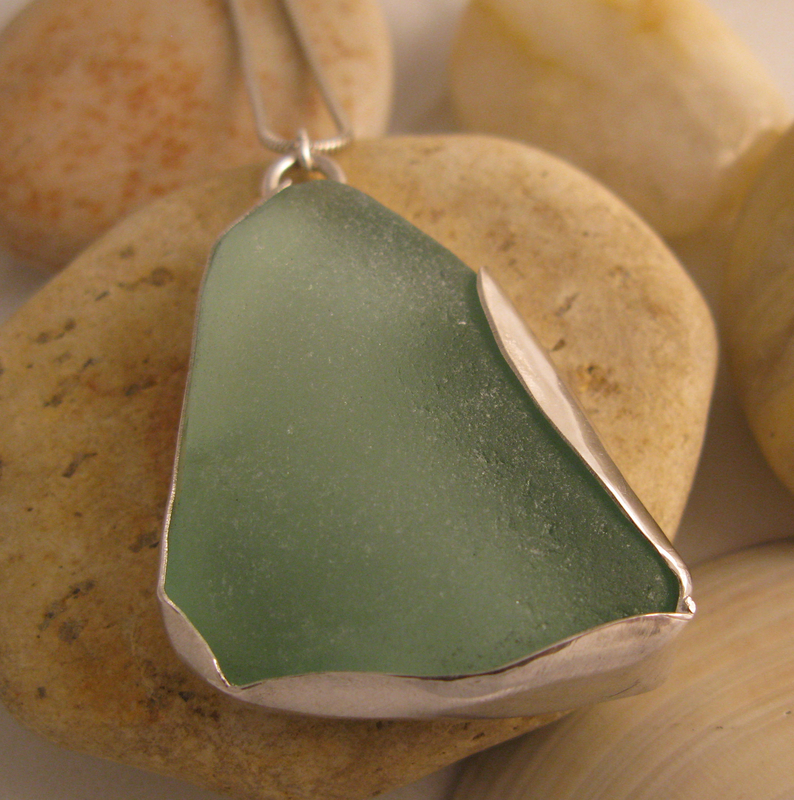 If you really want to make a hole in your sea glass, you can do so. Drill with a diamond bit, under cool water, carefully and slowly! I found out the hard way: it is easy to crack your piece of glass. One can insert a silver grommet in the drilled hole for added stability, as shown in the last picture. But you will have to tap the grommet with a hammer to close it. That is tricky and can crack your piece of glass too! Best to use very soft and thin metal tubing for this purpose. Have fun. 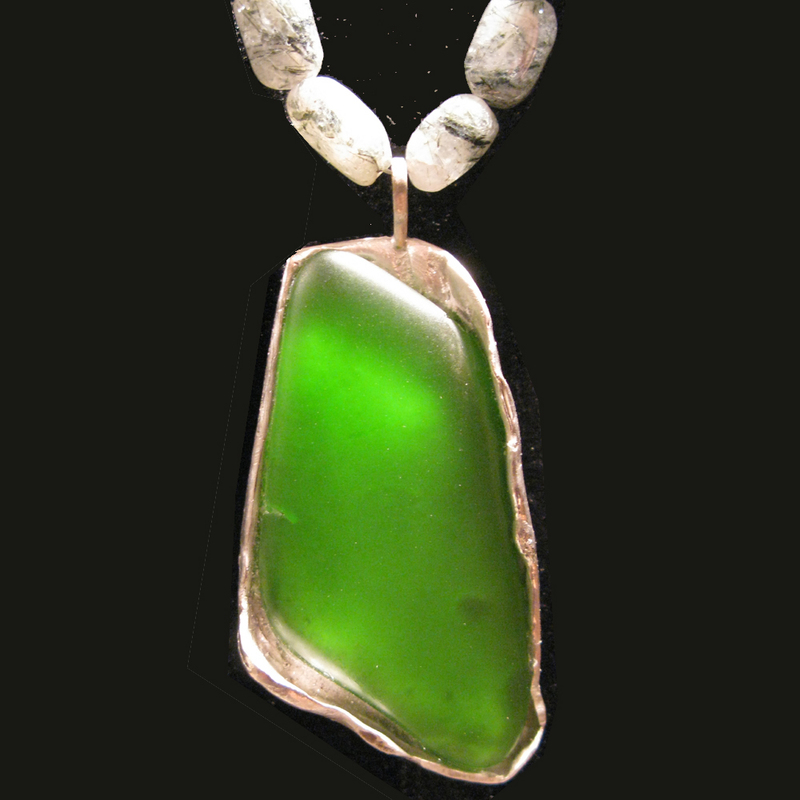 “Do you have beach glass jewelry?” That is a question I often get when I am exhibiting at an Arts & Crafts Fair. 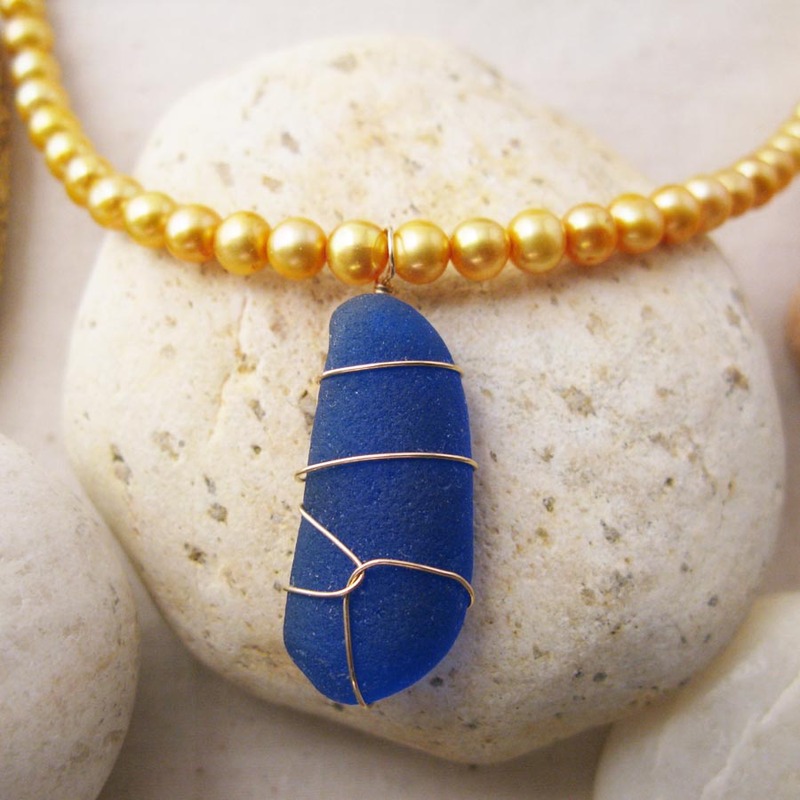 So, yes, I do work with beach or sea glass, terms which are often used interchangeably (see the images in this post). As any beachcomber knows, a nice piece of glass is a good find. An uncommon color, a well worn piece (which is old), a recognizable lettering or name that can help date the piece, these are features we all look for. I have learned that beach glass is very popular. 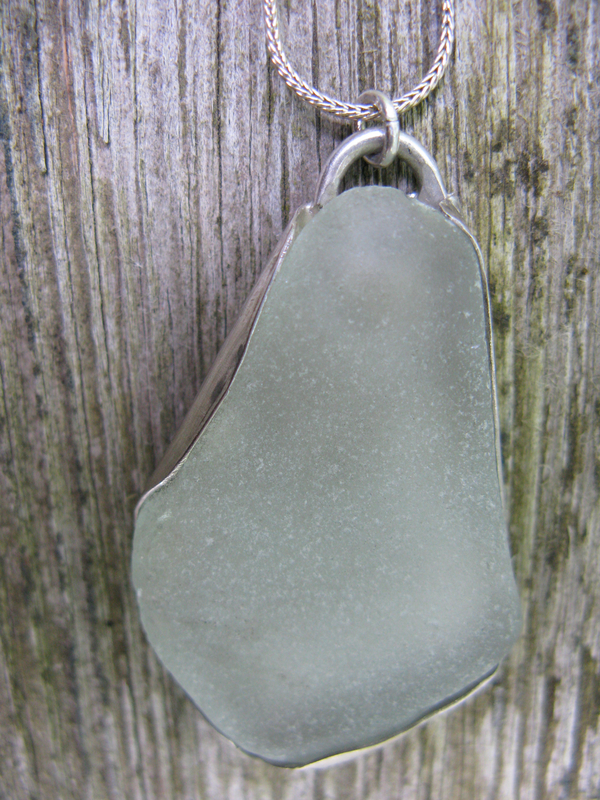 A search on the etsy.com website for “beach glass” got 12,484 hits and a search for “sea glass” got 22,050 hits. Those are items for sale, either handmade jewelry, vintage pieces or supplies (such as bundles or bulk lots of beach glass). Even with so many buyers and sellers, there is surprisingly little knowledge on this product. So I tried to educate myself and researched the web on beach glass and found some interesting stuff. The Wikipedia page on “Sea Glass” is informative. It is particularly strong on the colors that are sought after and links each color to the possible source: for example red sea glass from old Schlitz beer bottles (1900-1982). Schlitz was a brewery in Milwaukee, Wisconsin, which became Stroh Brewery and is now Pabst Brewing Company. As with red glass of Schlitz bottles, there are many examples where the particular color helps to date the glass. Much of this information comes from a book written by LaMotte, who is referred to as the “Godfather of Sea Glass”. LaMotte together with Charles Peden founded the North American Sea Glass Association (NASGA). Their website has news about the Sea Glass Festival in October. A very useful page compares natural (genuine) sea glass, versus “craft glass” (or artificial glass) tumbled in drums rather than by the action of waves over many years. You can also find information on antique bottle collecting and a link to Antique Bottle Collector’s Haven! On this site you can appraise your antique bottle and date it. 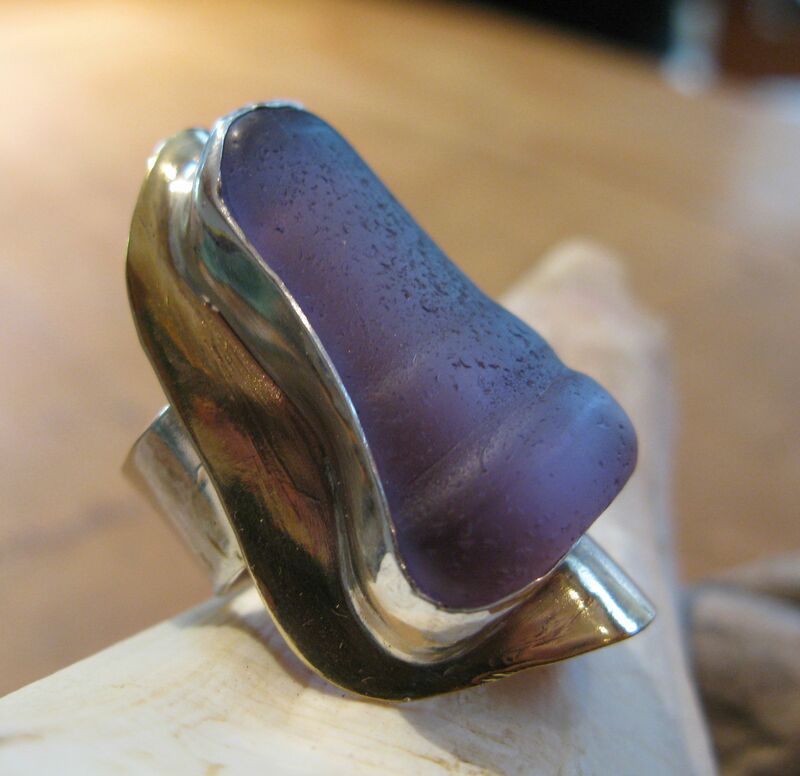 An interesting article describes the amethyst color brought out by sunlight over the years. It is due to manganese dioxide that was added to glass prior to the 1920s to produce colorless glass by counteracting the natural green hue from iron. Manganese when exposed to UV light over the years turns to an amethyst color. A frequent query is about which beaches have sea glass. It turns out that old dumping sites are where you need to go. There are a few well know ones such as Glass Beach in Fort Bragg CA. But also many others world wide. Storms are supposed to unearth old sites of beach glass. But I think you are better off asking locals about where the town dump used to be 50-100 years ago! A how-to-method for walking the beach and scouring for beach glass can also be found on the web. I have a page on the 40 Beaches of East Hampton town. Some of these beaches contain lots of sea glass, in particular around the ‘Promised Land’! Finally I found an interesting story about Louise Rogers who made a fortune with her hobby of collecting sea glass. She has over a million pieces that she found personally. I have also got some new sea glass pieces listed in ETSY. Most of us do not realize that diamonds come in different colors. The typical clear and sparkling diamond is what De Beers has marketed for 100 years or so…but if you want to own something truly unique consider this. Diamonds have an extremely rigid lattice. 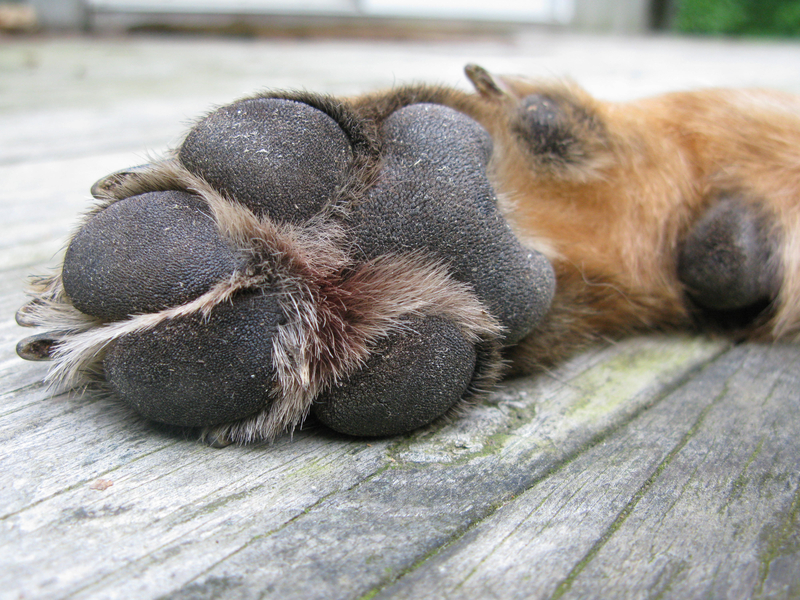 They can be contaminated by very few impurities. Thus the clear, colorless appearance of those diamonds designated ‘gem quality’. Small amounts of impurities (about one per million of lattice atoms) will color a diamond blue (boron), yellow (nitrogen), brown (lattice defects), green (radiation exposure), purple, pink, orange or red! ‘Plastic deformation’ is the cause of color in some brown and perhaps pink and red diamonds. In 2008, the Wittelsbach Diamond, a 35 carat blue diamond, once belonging to the King of Spain, fetched over US$ 24 million at a Christie’s auction. “Black” diamonds are not truly black, but rather contain numerous dark inclusions. White dwarf stars have a core of crystallized carbon and oxygen nuclei. The largest of these found in the universe so far, BPM 37093, is located 50 light-years away in the constellation Centaurus. The Harvard-Smithsonian Center for Astrophysics described the 2,500-mile (4,000 km)-wide stellar core as a diamond. It was referred to as Lucy, after the Beatles’ song “Lucy in the Sky With Diamonds”. I was recently on ETSY, a site for handmade crafts including jewelry. I searched this huge site with about 250,000 virtual shops for ‘red diamonds‘. Click and take a look. Gold ring with rough diamonds: 2 are yellow and 2 are red. There are more red diamonds here. We recently saw an amazing documentary: “Cave of Forgotten Dreams” by Werner Herzog. This film describes artwork created some 30,000 to 40,000 years ago at a time when woolly mammoths reigned. The depictions of animals, such as horses, rhinoceros, and lions, are incredibly sophisticated and the artist even employs animation methods to give the impression of movement. I take this as evidence that animals have long been a favored subject of artists, even when we were still cave dwellers. During the Renaissance, Albrecht Durer (1471 – 1528) was a master artist famous for his prints. Beautifully detailed pictures of animals (and plants) testify to his love of nature. Interestingly Albrecht’s father was a goldsmith. Shah Jahan, famous for building the Taj Mahal, had a fabulous statue of his falcon made. It is completely covered in precious jewels. I saw this piece in the Museum of Islamic Art in Doha, Qatar, and have previously posted on this topic. So I take it that jewelry representing your favorite pet is an age-old thing! This is a small silver plaque with paw prints etched on it. The idea came from my fantastic dog trainer, Gail Murphy. Kenda loves Gail more than anyone. You can have the name of your dog etched or hammered on to this plaque. This pendent was recommended by our local news e-media, the patch.com, as a Christmas gift. And here is an expensive dog tag with 40 little diamonds! 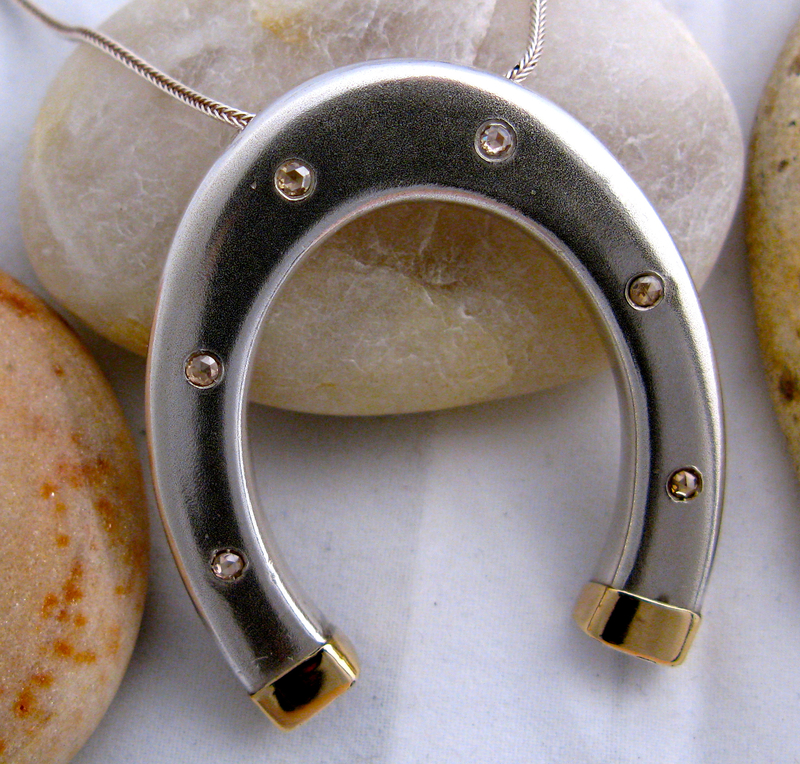 For the equestrian horse enthusiasts, here is a horse shoe in Sterling silver with gold caps and diamond nails! Personal variations are quite in order. One customer ordered this item with blue sapphires to emulate the horse shoe symbol of the Baltimore Colts football team! I would really love to hear from you, specially all of you with pets.